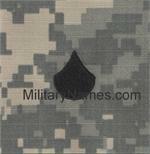 ACU UCP 3 SIDED HELMET BAND Military Name Tapes & Rank Insignia. Leather Flight Badges for all Branches of Service. BLACK METAL ARMY QUALIFICATION BADGES WITH PIN ON BACKS.